I’ve always wondered what it would be like to stand beside the bells atop the Patterson-Morehead Bell Tower as they proudly ring the melodious tune of Hark the Sound. The bells’ vibrations echo across campus, piercing the air with the constant reminder of our love and loyalty to this place we call Carolina, this place we call home. There is a familiarity about the song that comforts us, stays with us, and ultimately shapes our identity — its music moves us. For me, music has always been the way I express what I feel inside. Its intangible form creates opportunities to share with others, allowing them to experience an emotion of their own, to be moved. During my first three years at Carolina, I was privileged to perform in the UNC Clef Hangers, an a cappella group that thrives on making music and sharing it with audiences across the world. A family friend, Brittain Cherry ’01, was in the group when I was in the sixth grade, and I never missed a concert after that year. I knew that if I got in to Carolina, I wanted to join the Clefs and become part of the group’s rich history of musical excellence. This is a quick glimpse of how being a part of a singing group, a tradition of musical excellence and brotherhood, shaped the story of my Carolina experience. Still in high school, a recently accepted senior to UNC, the day had arrived. I was going to brave the audition a semester early for the Clefs, mostly to get a feel for what they expected and take notes to better prepare over the summer. I had my dad call my high school and check me out for “family/personal matters” so I could get on the road for my 4:30 p.m. audition in Murphy on Polk Place (locations that had little meaning to me then). The drive to Chapel Hill from Eden, N.C., passed quickly and before I knew it, I was standing in Murphey 105 in front of 16 faces staring back at me, ready to judge my pitch, blend and solo. My selection (I Can’t Make You Love Me by Bonnie Rait) was one the group did back during Brittain’s days and is one of my all time favorite Clef covers. The rest of the audition consisted of blend exercises, range checking and an interview. I’ll never forget when four of the guys got up and stood around me, one bass, upper tenor, tenor and baritone, and handed me the sheet music for the group’s most popular songs, James Taylor’s Carolina in my Mind and Toto’s Africa. I was supposed to sight read and sing the Tenor 2 part confidently — this was clearly a learning curve challenge. My hands went numb holding the music. The moment the five of us took a breath and sang our first chord, I felt part of something so much larger than myself. I felt connected to the guys, to Brittain, to the first Clefs back in 1977 and to Carolina; though I was still a senior in high school, it was in that moment that I define the beginning of being a Carolina student. Every fall and spring, the Clefs perform a major concert in Memorial Hall, the premier concert hall of UNC. To say that we rehearsed a lot before these concerts would be an understatement; preparation for a Memorial concert meant countless hours of perfecting our sound, our set list, publicity, etc., for weeks prior. At times I remember it feeling like a legitimate career, being a Clef. The group mentality is that if one person is absent, the group’s sound is inevitably weaker. We survive as one entity, everyone committed to the group’s success. The first time I performed in Memorial, I thought I was going to pass out from the excitement. I remember standing behind the curtain in our formation, waiting for CJ Skender (our faculty adviser) to wrap up his famous jokes and introduce us. At that moment, the lights went black, the curtain slowly lifted and we began Africa, bopping hard with our vests and bowties on, and the stage just lighting up. It was as if I was on stage with U2 or Journey; over 1,400 people come to these concerts, and it is our duty to rock out on stage for them. Words can barely describe the emotions running through me: high adrenaline, exposure, exhilaration, among others. Stepping up to the microphone to perform my first solo (The Fray’s You Found Me), I recall how the song reverberated throughout the Hall, filling the space with the sound of our voices, no instruments. A cappella songs are already rendered vulnerable by their nature. Amplifying the sound of voices, our voices, allowed us to transcend the mechanics of singing syllables and non-English background noises to create something special, something unique, for anyone in the audience; we created a musical experience that tied peoples’ memories to that space and time, just as our Bell Tower does when it chimes the fight song. We created Carolina memories. To me, the point of college is to envelope one’s self in an environment that supports, encourages and ultimately engenders intentional curiosity, personal development and innovative engagement. Outside of the classroom, the Clefs served as my niche where I believe much of who I am today manifested. Clefs gave me a sense of confidence about who I am, what I am capable of, empowered me with the knowledge that I can be bold and succeed. There is no way I would have had the support or confidence to run for student body president had it not been for the Clefs. In my search to do more, to rise up and give back to Carolina, the Clefs were there every step of the way, even though it ultimately led to my resignation from the group a year early. I wouldn’t trade the lifelong friendships, memories of making music or the lasting impressions the Clefs had on me for anything. They are all part of my Carolina experience, and I have been changed for the good by knowing and singing with them. 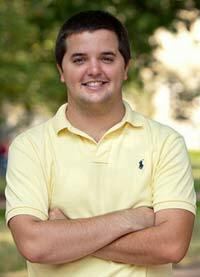 Hogan Medlin ’11, student body president and a native of Eden, majored in political science. He plans to work in Southeast or East Asia before returning to graduate school.